← I am off to drink cider and roll around in some mud for a while – can that be political? @steve: I am as disappointed as you that most Tory MEPs plan to vote against emission targets. And if they are defying their own stated party policy (something on which I shall take your word as I am no export on Tory party policy) then that is clearly an indication of a schism in the party on environmental issues. Clearly the Tories cannot be trusted on climate change, and it is only because of being in coalition with the Lib Dems that they are taking the issue seriously in government. So Tory MEPs are bad for progress on stopping climate change. But as for their being any sort of threat to democracy: certainly not. Elected representatives can vote how they like. And the EU is based on separation of powers; it is the job of the European Parliament to scrutinise the actions of the other two branches, the Commission and the Council, whatever the political stripe of the people there. As part of keeping to the Coalition Agreement, I would expect the UK government representatives in the Council to push for the 30% reduction, but MEPs can do what they like. And the idea that a party is the tool of its leader, who can dictate how its elected representatives in any legislative body should vote, sounds rather Stalinist to me. It certainly isn’t how my party works. Democracy ceases to be effective when politicians can act (and vote) with impunity. UK MEPs of all colours have little accountability in Brussels because of the institutionalised ignorance of EU based politics in this country (combined with a virtual media blackout). So yes, the European Parliament is directly elected, but UK MEPs can act as they wish on 99% of votes/issues. European Elections have always been based on the colour of your rosette (reinforced by the list system of voting), not how you voted. The reason I specifically highlight the Tory issue is because their MEPs actions (and affiliations) ten to be much more extreme and different tot their UK based colleagues. In relation to your point on Stalinist esq leadership styles (firstly have a look at this and ignore the manga video http://www.youtube.com/watch?v=og9FHex-OlQ) but more seriously, I think elected politicians have a responsibility to their parties, and the elected leader of the party has a responsibility to use his/her influence to create a cohesive party. Most elected individuals are elected from a mandate of representing their parties, not from them as a particular individual. If MEPs have little accountability in Brussels, then it’s mainly because people CHOOSE not to hold them to account by not voting in European parliamentary elections. If this is a reason to have party HQs dictating how MEPs should vote, then we might as well do the same for local elections (which also have low turnouts, and people arguably use them anyway to give their opinions on national governments), and have party HQs dictating how party groups in local council chambers vote. And if elected representatives are expacted always to follow the centrally-imposed party line, then why have let them vote independently at all? It would make much more sense to have a formal block vote arrangement where MPs, MEPs and councillors are deemed to vote en bloc as decided by their party’s central office. Of course, this would not be desirable, as it would effectively lead to an “elective dictatorship” in which all power is wielded by party bosses (in particular, the “Big Boss”, or party leader”) with no accountability for their actions. And this is why I referred to Stalinism. The Youtube post was just about people rashly comparing things they don’t like to Hitler and Stalin. But I was making a proper comparison based on party management: this top-down ‘democratic centralism’ that you seem to advocate is a strong part of far-left thinking, and was integral to how the Soviet Union was run. The European Parliament is strongest when it acts independently of national governments. If it were just a chamber of national delegations, voting as national government and opposition blocks, then it would have less influence than it has now, and even even fewer peopls would vote for it. There would be little point in its existence, as it would just echo the Council. Remove/neuter the only part of the EU that is actually democratic? I think this would be a step in the wrong direction. I disagree politically with the Tory MEPs plans to vote against emission targets. But I accept that they are entitled to do so. I disagree with it in the same way as I do with any bunch of MEPs voting that way. The schism between the Tories in the UK and EU parliament is certainly a problem — for the Tories. And I hope and fully expect that my party will draw voters’ attention to this, and to their EU bedfellows, in forthcoming elections (particularly the next EU and UK parliamentary elections in 2014 and 2015). And there is no contradiction between Lib Dems speaking out and campaigning against the Tories in the EU and being in government with them in the UK, precisely because there is no Coalition in the European Parliament. If the Tories in the EU parliament were expected to follow the Coalition Agreement, then the same must surely apply to the Lib Dems. So the Lib Dem MEPs would not be allowed either to vote with their beliefs on an issue that where at Westminster the MPs have been forced to compromise. I accept Tory MEPs’ right to deviate because my party’s MEPs can do the same. Tory and Lib Dem MEPs are not bound by the Coalition agreement, which is something that applies ONLY to the UK national government at Westminster. Whatever you may think of Tory MEPs and their stance on climate change, they have every right to assert their independence and support what they see as pure Tory policy. As a Lib Dem, I would certainly expect my party’s MEPs to vote for Lib Dem policy, even where this means defying the present government. 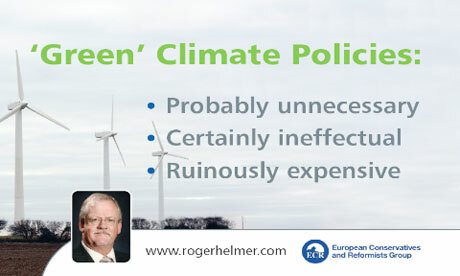 Tory party policy states that “We will push for the EU to demonstrate leadership in tackling international climate change” – now although that does not explicitly state they will back a 30% reduction, I (and anyone who has a grasp of the severity and timescale of the threat posed by climate change – so that excludes about half of the ECR group) would consider it to be axiomatic that this includes pushing for a 30% reduction by 2020. As such, I think they are defying their party AND the coalition agreement. The point here is that Cameron’s MEPs have the potential to undermine the (at times) good work this coalition gov’t is doing in tackling climate change. Climate change cannot be tackled through individual nation’s states; it needs to be done at supranational and international levels.